For over 30 years, Dilys Evans has been deeply involved in the fine art of children’s book illustration. In 1980 she foundedThe Original Art, an annual exhibition in New York featuring the best children’s book illustration of the year. Now, in thisfascinating exploration of children’s book illustration, she focuses on the work of 12 contemporary illustrators. 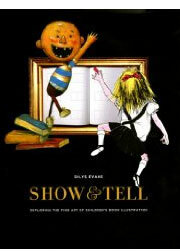 Lookingat the wide variety of artistic genius in children’s books, Show and Tell teaches the reader how to look for the perfect marriage of art and text, and is an invaluable guide for anyone interested in children’s books and the art of illustration.